John Glenn, one of the most inspirational astronauts who became the first American to orbit the Earth and the first senior citizen to venture into space, has died aged 95. Glenn died on Thursday at the James Cancer Hospital in Columbus, Ohio where he was hospitalised for more than a week. The former trailblazing astronaut had been battling health issues after suffering a stroke a few years ago. Glenn undergone a heart valve replacement surgery in 2014. 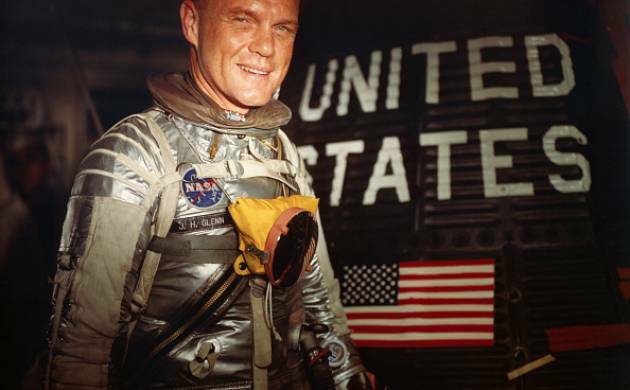 “We are saddened by the loss of Sen John Glenn, the first American to orbit Earth. A true American hero. Godspeed, John Glenn,” NASA tweeted immediately after his death was announced by the Ohio State University. Glenn was a decorated combat veteran and test pilot who gained worldwide fame after becoming the first American to orbit the Earth, went on to become a US senator and in the autumn of his life returned to space aboard the shuttle Discovery. #On February 20, 1962, when Glenn rocketed into space. # He made history a second time in 1998, when he returned to space decades later at the age of 77 only to become the oldest person sent into space. #Glenn flew 59 combat missions in the South Pacific during World War II. # In 1974, he was elected to represent Ohio in the US Senate. #Glenn has a record of circling the earth three times and the first to get into orbit. Not only this, Glenn was the last of the original Mercury 7 astronauts who launched the US space programme. Glenn also received the Presidential Medal of Freedom, the country's highest civilian honour, in 2012, by President Barack Obama.